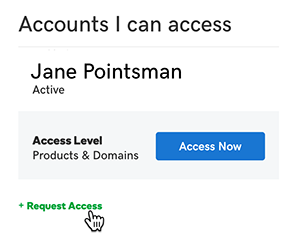 If you need to help someone manage the products in a GoDaddy account, you can request delegate access from the account owner. 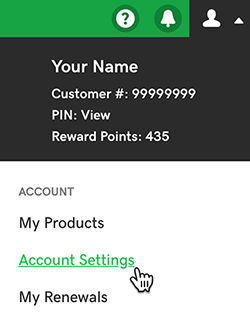 Delegate access allows you to open and use products in the account without needing the account password. At the bottom of the Accounts I can access section, click + Request Access. Account holder name Enter the name of the person who owns the account you want to access. This person will see the name you enter in the email notifying them of your request. You'll also continue to see this name in your list of accounts you can access. Account holder email Enter the account owner's email address. This doesn't have to be the email address on their GoDaddy account. You can enter any email address that the owner uses. Access level requested Select the access level you want. The account owner can change your access level before accepting your request. We'll email the owner your request. Once the request is accepted, we'll email you a final confirmation. Once you're given access, it's easy to log in to the owner's account. Learn more about which products support delegate access. Delegate access is not reciprocal - that is, if an account owner invites you to access that account, that owner does not also receive delegate access to your GoDaddy account unless you invite that owner. Pending access requests can't be cancelled, but they expire automatically if they are not accepted within 48-72 hours.